These glasses would turn any event into unforgettable days & nights. These are the perfect addition to any children's or adult parties and offer a fun, yet safe & hygienic way to enjoy any night. The glasses come with built in batteries with a strong paper enclosure to keep the batteries charged during non-use. Simply remove and reinsert, turn on the easy to press switch in the middle & enjoy your party. The frame of the glasses are made of durable plastic and can be worn for fun even after the batteries for the LED light up feature have taken their last breath. The sides of the glasses are flexible and adjustable for comfortable fit for varying facial frames. The earpieces are made of flexible plastic to adjust to the frame of the face of the wearer. This 12 pack collection comes in four (4) assorted colors: Green & Pink, as well as Red & Blue, presenting a large enough variety to choose from for any guest! Each pair is covered with their individual packaging making it the most safe to wear & hygienic party favor glasses you can find! Each pair measures approximately 6 inches by 4" inches wide at its widest & highest points. The frame is delicately and intricately designed with attention to detail. This is the perfect fun party favor, goodie bag or stocking stuffer. The range of use at the parties is limitless and is perfect for Halloween, Birthdays, Costume Parties, New Years Eve, Christmas, Easter, 4th of July (Independence Day), Easter, Veterans Day, Memorial Day, Bachelor Parties, Bachelorette Parties, Baby Showers, Hannukah, Eid, or Fun Get Togethers! Turn your guests into superheroes, batmans with wings & shields, and create phenomenal lasting memories to last a lifetime! Perfect Addition To All Parties & Occasions. Turn Every Party and Gathering Into an Unforgettable Event. Your Imagination is Your Only Limitation: Use at Halloween, Concerts, Parties, Sumber Parties, Christmas & Holiday Parties, 4th of July, Get-Togethers, Masquerades, Costume Parties, Mother's Day, Father's Day, Birthdays, Baby Showers, Pool Parties, Memorial Day, Veteran's Day, Labor Day, Beach Party, Role Playing, Goodie Bag Stuffers, Party Favors, etc. 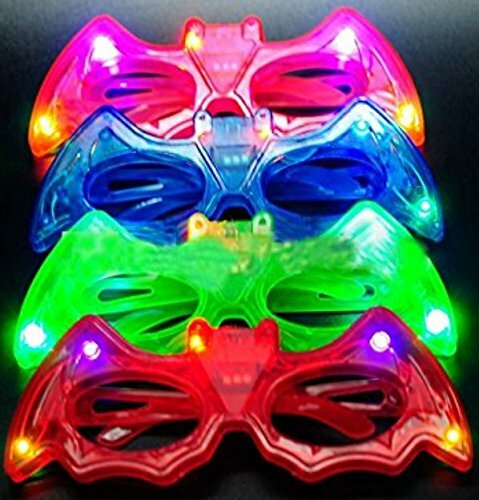 This Package of 12 Flashing Batman Wing / Shade Glasses Comes in 4 Colors: Green & Pink, Red & Blue Making it the Perfect Choice for Boys & Girls. Assortments of the colors may vary. The Frame of the Glasses are Made of Durable Plastic & Batteries are Built in with No Need to Waste Assembly Time (Uses High Quality 3 AG3 Batteries to run (Included) for hours of nonstop fun).